Had an interesting aroma with alcohol smell. Pours with a really nice, big head. A really good, sweet, malty, clean taste with a subtle hint of hops at the finish. Good mouthfeel. A very drinkable beer that's not too strong, simple, tasty and just hoppy enough to leave you wanting more. A lovely malty Oktoberfest, with a good amount of sweetness, a little caramel flavor, a nice head, and a smooth feel. I enjoyed American versions such as Sierra Nevada but you just can't beat this. A: Pours a clear deep amber in color with moderate to heavy amounts of active visible carbonation rising quickly from the bottom of the glass and faint light golden yellow highlights. The beer has a finger tall dense foamy beige head that slowly reduces to thick film covering the entire surface of the beer and a medium thick ring at the edges of the glass. Light to moderate amounts of lacing are observed. S: Light to moderate aromas of toasted, caramel, and bready malts with a slightly stronger aroma of spicy hops. T: Upfront there are moderate flavors of bready, caramel, and toasted malts (in descending order of strength) with minimal amounts of sweetness present. That is followed by moderate flavors of spicy hops which impart a light to moderate amount of bitterness which fades pretty quickly. M: On the lighter side of medium bodied with moderate amount of carbonation. Smooth. O: Easy to drink and sessionable, definitely a nice example of the style and a beer that I could easily have over and over again - kind of reminds me of time spent at Oktoberfest in Munich in 2000. Pours an excellent copper color, totally transparent, with an airy white head that dissipates in a hurry. All aromas are very subtle in this beer. Toasted caramel malts with a bread-like property make up the nose and a faint floral aroma sits in the background. Lots of toasted malts at the forefront of the flavor profile. A slight metallic tinge. Hops seem to creep into things the more the beer warms up. Mouthfeel is good, carbonation is excellent. Very drinkable. A: The beer poured clear amber in color with a thin white head that quickly faded away leaving a ring of bubbles around the edge of the glass. A moderate to high amount of carbonation is visible from the rising bubbles. S: There are light aromas of bready and caramel malts in the nose along with some hints of spicy hops. T: The overall taste is very balanced between some malty sweetness with notes of caramel in the initial taste followed by a subtle amount of bitterness in the finish. M: It feels light- to medium-bodied on the palate with a medium level of carbonation. D: Drinking this beer is a breeze; it goes down very smoothly, which makes it very sessionable. Keeping it real for you you guys. Drinking this as it is a Marzen. This brew looks pretty in a glass. No lies. Beautiful medium copper/amber body with a big soapy white head. The aroma is that of toasted cereal grains and a touch of caramel. Taste as expected, toasted grains with residual sugars that help accent the caramel notes. Finishes semi clean and a little dry with a grainy aftertaste with a hoppy snap to it. The body plays on the palate with its feather weight smoothness and it's par carbonation. Overall: Maybe this style of beer is my favorite. It's traditional refreshing and not really anything bad about it. I could crush a sixer of this with no problems. It's not adventurous yet isn't infected either just a good wholesome brew to watch Football or any sport for that matter. This brew is worthy! A nice dark amber color, slightly opaque, with a thin white head that left quickly. Muted nose with some crackery malt and mild grassiness. No hop notes. Taste followed with a muted light malty flavor, cracker, grassiness and a dry feel. Medium carbed and medium-bodied. I was surprised that I didn't like this more, but I prefer many others in this style. Wow. I was super disappointed the first two seconds of my pour because it looked like Coors light but some how it goes to a decent looking Marzen color at a snap - incredible; I've never seen that before!! Not very malty smell; pedestrian. Good flavor a but too light compared to a lot of other Marzens which is surprising that it comes from Munich. Appearance: Amber/light brown body with a light, white head that disappears quickly. Leaves a little lace afterwards. Smell: Rich roasted nuts. Caramel. A slight floral aroma. Taste: Very sweet throughout. Lot of malt. Tangy flavor. Grassy aftertaste. Mouthfeel: I noticed a lot of carbonation. Decent mouthfeel. Just a little on the watery side. Pours a nice amber color that resembles a glass of iced tea and is capped by a very loose bubbly head that dissipates quickly to the thinest of collars. The nose is dominated by caramel and sweet, warm bread. Almost a hint of something slightly tea-like (green tea?). First sip brings a crisp tingle to the tongue followed by a huge, caramel, biscuity, sweet middle. The hops are somewhat absent at mid-point, but they come through with a fairly long, dry, crispy finish. Body is just thinner than medium and spot-on for the style. The sweetness may get a bit much for me over an average session, but I can't complain as this pint disappears. Plus, I sampling in 100 degree Georgia heat, so this might be better on the palate in cooler Fall temps. T: There is an initial malty sweetness laced with hints of caramel that is quickly followed by typical malty flavors such as bread crust with a subtle biscuity background. I am getting a slight metallic flavor and a some subtle "export" flavors from travel and abuse. M: Medium body with a moderately dry finish. Im sure this beer is one of the standards of the Marzen style. It pours a nice clear deep copper color with a good sized head. The smell was sweet of malt and a bit bready. Taste was sweet but not to. Slight hops bite in the aftertaste. Nice carbonation which helps make it smooth. I can drink this all night. I took a 5 liter mini keg of Paulaner Oktoberfest Marzen Amber on a camping trip. It poured a nice reddish, dark copper color with a white head. Very malty nose. Excellent malty flavor, really a fine drinker. Recommended, and I might add that the mini keg had the coolest graphic ever, three fat german guys (presumably at Oktoberfest) chugging mass krugs of Paulaner Oktoberfest, no doubt. Date on the bottle says 04/08 but, whether this is a best buy date or a bottled date I don't know. The guy selling it said they just got a shipment in so I hope it is a bottled on date. This beer pours a deep caramel brown with a slight off white head that left no lacing down the sides of the glass. The aroma is toffee, raisins and a bit or roasted malts. The taste is much the same with caramel really dominating the flavor profile for me. The mouthfeel is a bit thin for me, also a tad astringent at the tail. While no the best O'Fest (I'm thinking about you Ayinger O'Fest) I've had, its still a great beer to imbibe on a nice cool evening. I'm happy to try this one after having the golden, slightly maltier helles style beer that is their Wiesen Oktoberfestbier. This is what I expect, as an American, from a traditional Oktoberfestbier. It's a bit clearer than American versions of the style - is that a good thing, or a bad thing? It actually makes the beer look even more appetizing, if unexpected. It's still dark amber gold, and is darker the fuller the glass. 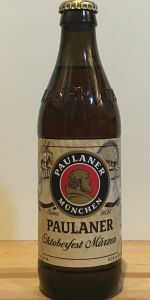 I only wish I had my Paulaner Masskrug full of this right now, instead of just the one in an old tulip pint. It doesn't have a lot of smell, but then again, I've just had 2 Weihenstephaner Korbinians pints. Taste is great. This is a Marzen, and would all should aspire to be. It's not fresh, but it's not bad either. I'd love to have this one fresh, and may re-review next fall. Mouthfeel is awesome. It's appropriate for the style. Silky smooth amber lager.